(If you are reading this post on a RSS reader, you might want to click through to Chez Pim for the slideshow. In Gascony, you're not invited in for coffee. You are invited for pruneaux. Not just simple prunes, mind you. The prunes they serve in Gascony after dinner - or as a side to a dishy conversation - are pruneaux à l'Armagnac, prunes soaked in Armagnac. Sweet, potent, delicious, and certainly not the stuff your grandma takes to stay regular. Unless your grandma is Tony Bourdain in drag. I've been pining over the prunes soaked in Armagnac since I came back from Gascony. One lucky day, I came upon a bag of prunes in my cupboard, Pruneaux d'Agen demi-sec that I bought on a visit to Kate's Camont earlier this year. I had nearly forgotten about it. Now I can have my own pruneaux at home. The first obstacle between me and my pruneaux is finding a bottle of Armagnac. It's not as easy as you think. If the Armagnac is too old or refined, it would be a crime to muck with it. While crappy Armagnac just isn't worth drinking, prunes or sans prunes. I'm not exactly sure how it happened. I got all dressed up to go to dinner, an al fresco barbeque at Rebecca's, and before the day is over I milked a sheep, witnessed a magical - if ever so mildly yucky - moment of piglets being born – the piglets were cute and pink and spotted and got big floppy ears, but before all that they were wet and mucous-y and bloody and stuff. Eh. And to top it all off properly, we came home with a cow. Ok, not a whole cow. Honestly. We just became a part owner of one. And now we get two gallons of her milk weekly - unpasteurized, non-homogenized, raw milk, just the way the gods intended. 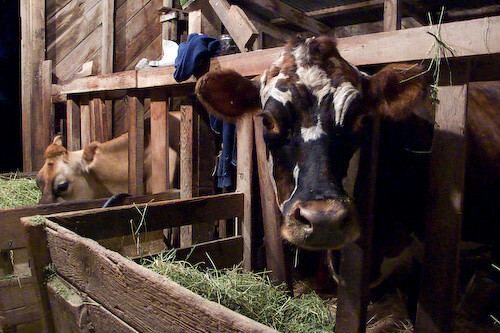 What to do with raw milk? The possibilities are endless. I'm thinking homemade butter, crème fraiche, clotted cream, et cetera et cetera. I'll try it all, I think, and will tell you all about it. Meanwhile, I'll just introduce you to Nutmeg, our gorgeous Normande cow in the picture above. And you can read about Bob and Jean of Deep Roots Ranch who graciously allowed us to co-own Nutmeg. You can also check out our friend Rebecca's blog, whose sheep farm and budding Basque-style sheep-cheese making operation is the genesis of all this. When her cheese making is fully underway I'll tell you more about it, I promise. Now back to my usual frivolity. With my city girl cred receding rapidly, I came home and decided to order some shoes. And what did I buy? A pair of cute rainboots from Tar-jay so next time I go visit Nutmeg and the piggies and the sheeps I would have something to wear. Oy. P.S. If you're going to Blogher, be sure to say hi and help me in person. P.P.S. If you've got a great clotted cream recipe, that'll be a great help too. My first clotted cream attempted failed rather miserably. Recipe, anyone? ...no, not a sheep either. All the bruhaha behind that thing that is not a plastic bag gave me a chuckle today. Lining up a day early to get your hands on one? A near riot at a mall in Hong Kong? 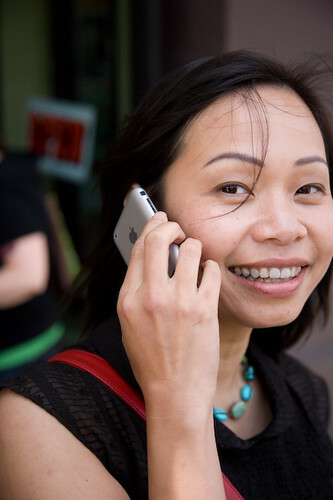 What do they think this thing is, an iPhone? Not that I have a problem with the not-plastic-bag thingy, mind you. I think the campaign is ultimately laudable. Getting more people to quit using disposable grocery bags is a great thing for the environment. But why should we all carry the same bag? 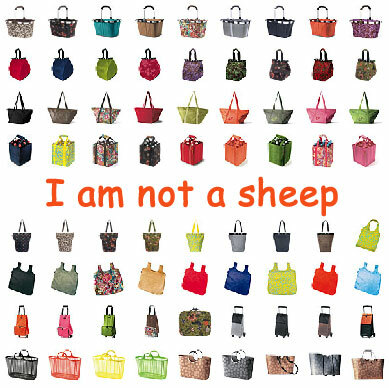 Perhaps the right message on that bag is not 'I'm not a plastic bag' but more like 'I'm a sheep'. For those not interested in going b-a-h, let me show you a few other fun bags that are just as righteous as that thing that is not a plastic bag. The choices are endless, really. You can even find bags that are themselves reused. Reused-reusable bags, how meta is that? A company called Elsewares.com sells rad shopping bags made from rescued Dacron sails and other super cool canvas bags just perfect for the trip to your local organic supermarket. Here's what's been cooking up at Manresa lately. Not something pretty – and pretty tasty – on a plate as usual. This one is just a tad more macabre. Chef's been personally cooking bugs that our lovely gardener Cynthia had collected just for this purpose. This was just another day in the life of a biodynamic garden. You've heard of that garden, yes? The procedure is called the ashing of pests - such a poetic name. It calls for collecting the pests that infest a farm, dry roasting them in a cast iron pan until they are burnt to a crisp. The cooked bugs are then crushed in a mortar until they are turned into ash, and mixed with ash from a wood burning stove. The resulting dust is sprinkled around the garden, particularly in the areas most affected by the bug infestation. The ash is supposed to prevent the bugs returning. Let this be a lesson to you bugs: don't f*** with my garden. I think that's the message – a slightly less gruesome procedure than mounting dead bugs like butterfly specimen and sticking them in the ground as a warning, huh? And it certainly beats spraying pesticides in my book. I wonder if the ashing of the pests work in life outside the garden as well? What do you think? Don't you have one or two pests in your life you wouldn't mind grinding into ash? Well, ok, before someone calls the cops on me, I certainly didn't mean grinding them into ash, but, you know, perhaps a bit of hair, or a half eaten sandwich from their plate. Wouldn't it be great? A sprinkle here, a sprinkle there, and p-o-o-f! My hand hurts when I type right now, so I've been baking instead. Playing with different dough recipes, fillings, fruits, berries - you name it. I've tried it. 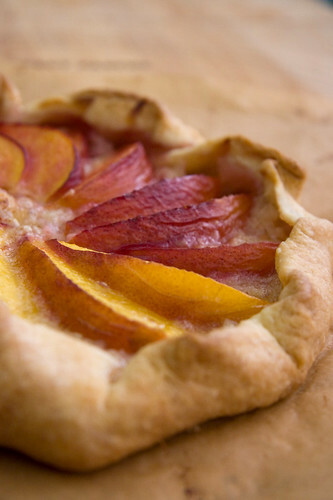 The best combination so far is this, a free-formed tart, with a smear of frangipane and a fan of nectarine slices. I'd give you a recipe, but unfortunately I've been playing mix and match with many different recipes, so, currently my frangipane recipe yields about 13oz of frangipane - that would be about 3 cup's worth - while this tart needs only a thickish smear as the base for the fruit. Not entirely practical, is it? You'll just have to be content with a picture for now I'm afraid. Hopefully I'll get the formula down soon. Pretty picture though, no? Delicious too if I might add. I should tell you also about that unmitigated disaster that was a tomato and roquefort tart this afternoon. The same dough I made this open-faced tart with, with a filling made of a combination of Roquefort cheese, Boursin - yes that Boursin - and whipped cream, then layered on top with the first crop of dry-farmed tomatoes - so fresh I picked them myself from Joe's farm today. Don't ask me why this combination. It sounded such a good idea at the time. Unfortunately, not so much with the end result. The cheese mixture turned out a rather disturbing shade of green - sort of like the stuff that grows in old, dirty sink - and no amount of lovely tomatoes would save it. Sad. Meanwhile, my hands smell of butter. My house smells of butter. Even little Ella does too. Life is not so bad. What have I done with the Olallieberries we picked the other day? Well, some went into this oh-la-la tart. I made a tart shell with the most basic tart recipe ever, a stick of salted butter, a cup of flour, and enough water to form a dough (which for me is just a tablespoon or two.) I think I got the idea from the Zuni Cafe's cookbook. Instead of putting Olallieberries in the shell by itself, I made a quick custard to pour on top. The same custard the French uses in tartes aux quetsches - a half cup of cream, two eggs, a quarter to half cup of sugar (depending on how sweet the fruit in the filling), and a pinch of salt. 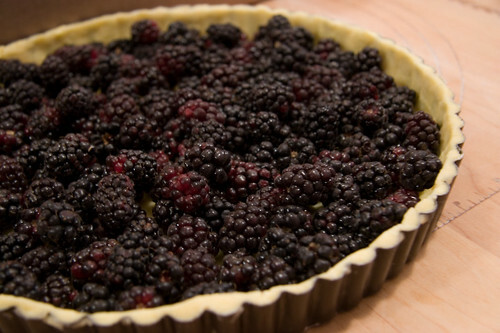 Mix it all together and pour into the tart shell over the berries. Baked the tart at 375F for about 30-40 minutes, until the custard is set and the tart shell done. So very simple. Here's what the finished tart looks like, the first picture in the slideshow is the tart on top of an antique glass pie plate I just got from my flea market visit. This is the tail end of Olallieberry season in Northern California, so when my friends Beccy and Sean asked me to join them to pick olaillieberries at a farm just north of us on the coast highway, I jumped at the chance. Have you had olallieberries? If not, you really should try. I love them. I mean, how could you not love a berry whose name is pronounced oh-la-la berries. Ok, some people say oh-la-lee berries, but I much prefer saying oh-la-la. Makes me happy just saying the name. It's a cross between something called Loganberry and youngberry. Don't look at me, I am just clueless at this as you are. Go check out Wikipedia yourself. I made my first ever batch of jam this weekend. Ok, it's probably an exaggeration to say a batch of jam, when the entire thing came out to be just about 18oz, just enough to fill one antique Pyrex refrigerator jar - newly acquired from a flea market (in the photo, cute or what?) - and a small Weck jam jar. I had not thought of making jams before. I'm a germaphobe so home canning and preserving scare me half to death. 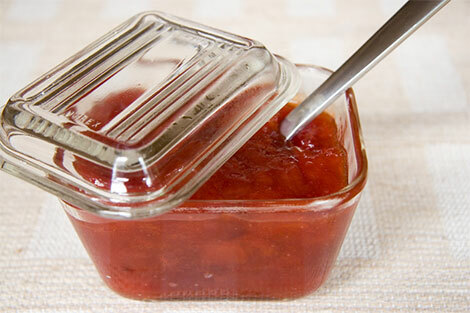 I'm always afraid that I'd end up killing my friends - or worse yet, myself - with an improperly sterilized jar of jam or tomato sauce. It's true that last summer I ventured to make a whole big batch of tomato confit, but those of you who saw that post should remember how I fretted through the entire process. The good news is I am down to my last jar of said confit, and am so far unaware of anyone having died from it. I was also forced into making that tomates confites because I could not find anything like it to purchase, so I had to make it myself. Jams, on the other hand, are plentiful to buy. I always keep my pantry stocked with a variety of Christine Ferber's and June Taylor's delicious creations - not to mention a random assortment from my travels. I was inspired to try this time when my friends Dave and Ally came to visit with a bag full of plums from their tree. The plums were too sour to eat, but they were so amazingly fragrant I just had to find something to do with them. I also had a few sweet, sweet Frog Hollow apricots in the case I bought from the market a few days ago. They were softening quickly, and must be used up before they were too far gone to salvage. Then an inspiration struck - jam! The deep red, fragrant plums and bright orange, sweet apricots would make a very pretty - and might even be delicious - batch of jam, I thought. 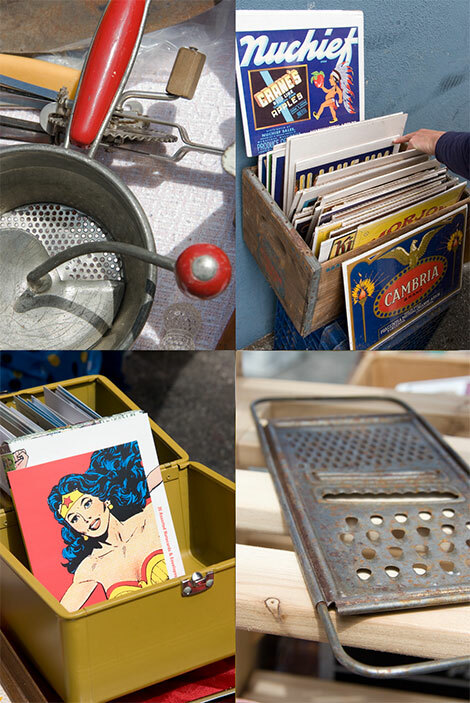 A few eye-grabbing items found today at a flea market I stumbled upon. What in the world has Pim been doing? ...no, no, not shooting a commercial for an iPhone. I wish. And I'd so do it just for a free one -or three, or thirty. That phone is not even mine. I ran into a group of guys in the mission who each had one. They got together and went to buy their iPhones. How cute! Sort of like girls going together to buy shoes. Someone very sweet in that group let me play with his. I've been busy alright, doing something mucho exciting I'll tell you about very, very soon. Sorry for the lack of post these past weeks. Chez Pim returns next week.